What Do Those Affected Most Think About Their 2005 Racing Slates? You can’t make everyone happy and the people at NASCAR Headquarters know that fact very well. As Don Hawk told Speed51.com’s Bob Dillner, there are far more things that go into planning a race schedule than the average fan, media member or competitor realizes. Now multiply that with eight tours to plan for and you can see the headaches beginning. Please click here for more on Hawk’s perspective. The Elite Series race at Pikes Peak on July 23rd is a combination event between the Midwest and Southwest Series. Many things need to be balanced in making a schedule. You don’t want too many events, but you don’t want too few either. But with eight tours, some are healthier than others. So when NASCAR released schedules for their Touring divisions last week, they shocked some people. There was some grumbling, but all in all, a racing community which is not shy about complaining is more or less satisfied with what NASCAR has done. Granted, it’s not perfect and you’ll soon see a few arguments why, but with all of the factors that need to be weighed, NASCAR won’t please everyone even if they hold 25 races a year in each division that pay $100,000 to win and are a tow of just a block or two from a team’s shops. Some of the criticism is valid. Some might not be. You be the judge. Jason Hogan is trying to understand both sides of the scheduling issue. A goal that NASCAR has when putting together a schedule is diversity. Short tracks have always been the home of NASCAR Touring divisions, but in recent seasons, speedways have been added as well. The Southeast Series goes to places like Kentucky Speedway, Pikes Peak is on the card for a couple of the Elite divisions and Busch North visits Dover and New Hampshire. Even road courses have made it to the docket of a few tours. Busch North goes to Lime Rock to end their season and the Southwest Series shares a weekend with the Nextel Cup teams at Infinion Raceway (CA) in June. Whether it is the beating and banging of short tracks, the art of road racing or even a little beating and banging on a road course like Lime Rock, the NASCAR Touring schedules have it all covered. Some guys, like Modified ace Chuck Hossfeld, just want to race as much as possible at as many different tracks as can be. tracks don’t want to book a series and take a gamble on covering the purse. Meanwhile, a weak schedule leads towards lower car counts. The most common problem heard about this year’s schedules is the amount of time that it took to get them out. Instead of having them ready for the end of the season or during the banquet circuit this winter, most tours did not see an official, or at least semi-official, slate until the end of February. Drivers are understanding to a point, but it is also a hardship to prepare budgets, figure out travel plans or attract sponsors if you don’t know when or where you will be racing. How would Hogan make it better in the future? One of the series that was most challenging for NASCAR when it came to figuring out a schedule was the Busch North Series. The tour is in a transition period. 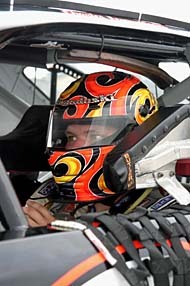 Late in 2004, it was discussed that a name change to NASCAR East and a not-so-gradual shift to more Mid-Atlantic and Southeastern races might be in the cards. Although events at Myrtle Beach, Martinsville, Richmond and Memphis were rumored, only one race south of the Mason-Dixon Line actually made it to the schedule. That date belongs to Virginia’s Motor Mile Speedway. 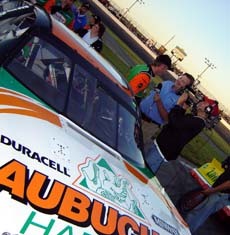 Tim Schendel in victory lane. “I wish they could get the schedule out before March,” said Schendel. “I think we all understand what a tough job they have and I don’t want to seem like I’m bashing on NASCAR, because I’m not. It would be nice to have it in December though. They have to realize how difficult the sponsorship side of this is for competitors these days, and when you don’t have a schedule until so late, it is near impossible to get sponsors to commit. Most companies set marketing budgets before November. If they ask where you are racing and you don’t know, it makes for a difficult and trying time. I’m a racer and not a marketing man. The transition and rising purse requirements for short tracks, made it appear that several staples of the tour in New England would not return to the schedule. Seekonk Speedway (MA) and Beech Ridge Motor Speedway (ME) are in fact gone, but several tracks thought to be in jeopardy remain. 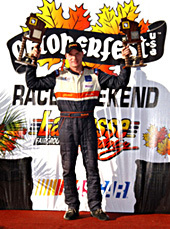 It was close for a few though; the season opener at Lee USA Speedway was just announced this past weekend. The tentative schedule actually showed the June 12th Thompson race as the lead off event. The Lee race means two good things for the series. First, it will get started in May and not June, Plus it will keep Busch North in a market within an hour of Boston at a track that fans and competitors enjoy. But while Lee survived, Watkins Glen did not, at least for now, and that leaves one less Busch North marquee event on the schedule. Many of the Busch North competitors are happy that they will be sticking close to home, but some see the value in expanding to a more national schedule. Quarterley hasn’t been afraid to put his money where he mouth is. 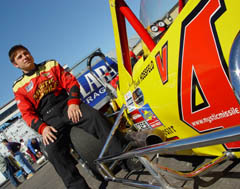 In the past few seasons, his team has towed as far away as Phoenix and Fontana, California to enter NASCAR West events. That has been no small task since his team is based an hour from the Atlantic Ocean in the central part of Massachusetts. Tracks are a touchy subject all around. The Modifieds have flirted with having close to half of their events at either Thompson, Stafford and Waterford (all Connecticut tracks) in recent years. Facilities that support a series and their fans that fill the seats should be rewarded, but where do you draw the line? “I think our schedule is a lot better right now than they said it was going to be about two months ago. It was looking like 10 races, maybe,” said Vidovich. “They’ve got it up to around 14 or 15 now. So it is better than it was. I’d say it isn’t as good as it used to be. Plus, every racer wants to have an event in his or her own backyard. Race placement is another thing important to competitors. Some changes to the schedules are not under the control of NASCAR Touring officials. For example, changes in the NASCAR qualifying procedures for Nextel Cup (moving their time trials to Saturdays at many facilities) have bumped support series to less than ideal dates. Most affected by this move are NASCAR Southwest Series and West Series races at Phoenix International Raceway (AZ) and the Busch North races at New Hampshire, which have been run on Saturdays for over ten years. When it boils down to it, there are two conflicting factors when it comes to having a perfect schedule. Racers want to run as often as possible, but costs also have to be controlled. Still, the smart competitors in the garage realize that life can’t be perfect. Scheduling is a balancing act. Is it better to have several races at a facility that sells out, like the Mods at Thompson, or do you take a chance on new markets? 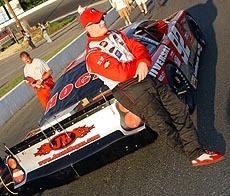 Andy Santerre won at Seekonk last year, but the Busch North Series won't be back there in 2005.